Editor’s Note: In celebration of college football bowl season, we present a look into the football experience at West Virginia University. There is something different about Morgantown, West Virginia. When football season hits in West Virginia, the air is already crisp with the scents of damp leaves and autumn air. It’s just a little something that West Virginians hold near and dear to their heart, something that gets engraved in a person’s memory and stays there forever. Pat White, Tavon Austin, Kevin White… The list goes on for successful Mountaineers, but one is most remembered for engineering the most iconic season in program history — former star quarterback and now College Football Hall of Famer, Major Harris. Harris finished fifth for the Heisman Trophy and still to this date is one of the best quarterbacks to ever play for the Mountaineers. The Mountaineers are most known for the 1988 season, with Coach Don Nehlen in old Mountaineer Field. Being at West Virginia for nearly a decade, Nehlen led the Mountaineers all the way to Arizona for the Fiesta Bowl, taking a tough loss against Notre Dame in the college football national championship. On the third play of the game, Harris’ shoulder was dislocated and caused what would ultimately lead to their demise. West Virginia has yet to play in the national championship since the loss, but remains the team in college football with the most wins without a national championship. Senior Abigail Harman has been on the Mountaineer dance team for three years, able to see the action as up close as possible. Harman went on about the sense of community being a Mountaineer brings to her and others. Terry Keenan has been a West Virginia fan for years. It all started back when he was serving in Vietnam. In 1970, Keenan was able to come home from his deployment and go to his first Mountaineer game, and then the rest was history. Before WVU had the newer Milan Puskar Stadium, there was Mountaineer Field that was built back in 1924,but retired back in 1979 due to the lack of room for expanding. “I seen the last game that was played in Mountaineer Field and a whole lot of them before that… and I been to every home game in the last 43 years,” Keenan said. Over the years, he has been able to collect tons of memorabilia and has dedicated an entire room in his home to the Mountaineer football program. The room has even been visited by Nehlen and profiled in the Charleston Gazette. Keenan renovated the entire bottom level of his home to accommodate his West Virginia memorabilia. The memorabilia that he collects from every game and every time he goes to a bowl game as well finds its way into that room to be incorporated with the rest of his WVU treasures. But the passion does not stop there. He has held season tickets for more than 30 years and says he will be attending the games as long as he is able to be there. Keenan has admitted that there were probably times he even missed milestones in order to spend his Saturday in the stands cheering on his favorite team. Hats, posters, rings… the list goes on for what is on display in Keenan’s home, but one thing stands out – a valuable piece of art depicting one of the best Mountaineer moments hanging on his wall, which was from “The Play” when West Virginia played Penn State in 1988. After the ball was snapped, Harris faked out the entire Nittany Lion defense and ran the ball in for a Mountaineer touchdown. Keenan has a signed piece of the goal line that Harris stepped right over when running the ball into the end zone. “My favorite thing about going is just the atmosphere of the game,” he said. Head coach Dana Holgorsen had a lot of talent under his sleeve — he has since left WVU to become coach at Houston. But in 2018 it started with the dynamic duo of quarterback Will Grier and wide receiver David Sills V.
Grier accounted for nearly 80 career touchdowns during his time as a Mountaineer, and has made what some would call as magic with Sills on the field. Grier and Sills played what was their last game at home in November, which ended very bittersweet as the Oklahoma Sooners took a victory back to Norman and also gained a spot in the Big 12 Championship. The Mountaineers’ regular-season losses were to Iowa State, Oklahoma State and Oklahoma. Grier and Sills both are expected to be playing on Sundays. Gamedays start early in Morgantown when fans wake up bright and early to turn on College Gameday on their television sets to prep for their long day of festivities. Milan Puskar Stadium has separate parking lots and most of the tailgaters set up in the Blue Lot to get the day started. Known by some as “Almost Heaven,” West Virginia is also known for being one of the largest party schools in the nation. But there’s a touch of old sentimentality for West Virginia’s anthem, “Take Me Home, Country Roads” by John Denver. Mountaineer fans basically bleed gold and blue and have often been described as a different breed of college football fans. Entering through the gates of the 60,000-seat stadium, a true Mountaineer can never not buy what is known as the Mountain state’s coolest drink: Zul’s Frozen Lemonade. Priced at $5 a piece and paired with a colorful straw, this lemonade is a must-have even on the coldest nights in Morgantown. Before every game starts, the Pride of West Virginia, The Mountaineer Marching Band rushes the field to give fans a performance of the WVU alma mater and fight song just prior to the team storming the field. 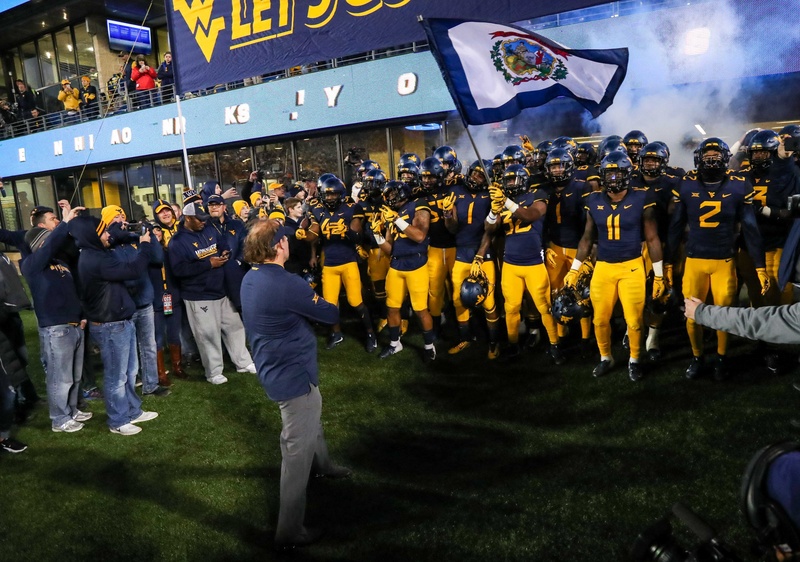 Once the band gets into the fight song, the cheerleaders encourage all of the fans to join in on the famous Let’s Go, Mountaineers chant, which echoes throughout the entire stadium and can even be heard throughout Morgantown. When the ball is kicked, the air changes. There’s something about football in West Virginia that changes the way people feel. Watching the Mountaineers is like everything stops and the only thing that matters is the game. One very special tradition is when the Mountaineers get a first down. Every fan in the crowd raises their arms prior to the announcer making the call. Once everybody hears, “First down West Virginia!” The entire crowd lift their arms up and down three times and yell back, “W-V-U first down!” And then point in the direction of play. It is something that began rather small, but evolved into a tradition. And lastly, the end. What happens after the game all depends on if WVU gets a victory. If the Mountaineers lose, then some fans go ballistic and scream at the Big 12 referees. If the Mountaineers win, everyone, even strangers, links arms and sings together while Country Roads is blasted throughout the stadium. Being a West Virginia fan is more than the football, it stems from family and is passed down through generations.